o como externo (pág. 28). Exteriormente, cada forma de una obra constituye un elemento. Interiormente, no es la forma sino la tensión que en ella existe lo que caracteriza o constituye el elemento. Y de hecho, no son las formas exteriores las que materializan el contenido de una obra, sino las fuerzas vivas inherentes a la forma, o sea las tensiones. El contenido de las obras de Julia Mariscal encuentra una de sus expresiones en la composición, es decir, en la suma interior organizada de las tensiones necesarias para concebir cada pieza. Ésta simple afirmación tiene la mayor trascendencia: su reconocimiento señala a aquellos artistas que aparte de lo material reconocen lo inmaterial o espiritual (pág. 28). se dirigen a él y se desarrollan a partir de él. un equilibrio matérico en las piezas. La línea se asienta livianamente sobre el vidrio, sobre el líquido y sobre el lineóleo. Kandinsky, Vassily, 1926. Punto y línea sobre el plano. Contribución al análisis de los elementos pictóricos. Paidós Estética: 2012, Barcelona, España. 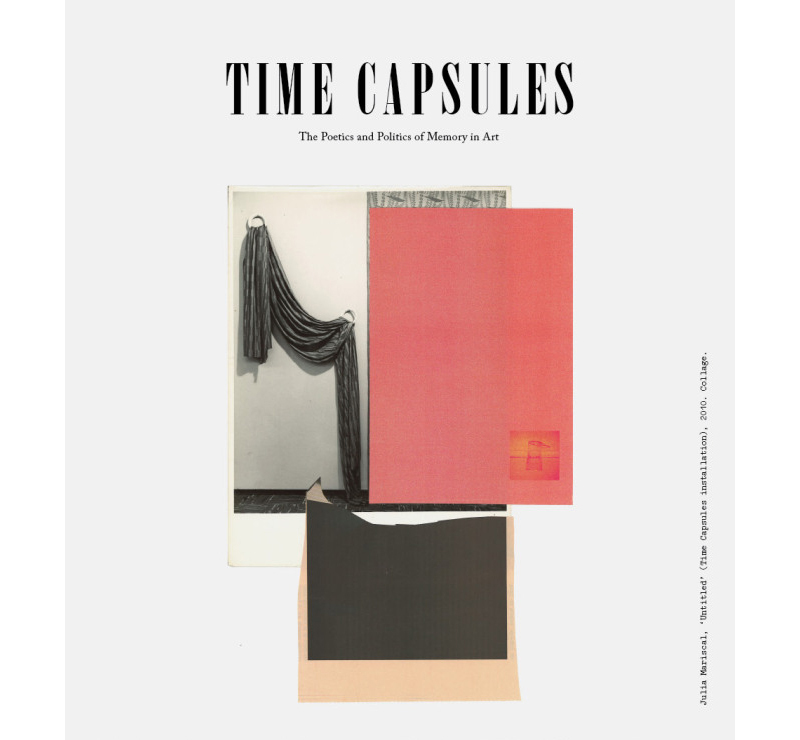 “Time Capsules is a meditation on the work of art as representation of time and the pervasive personal memories that haunt the artist when he/she faces a new project. It seems to me that, for a good number of years now, the category of space has been the main focus for many artists, curators and critics. Transnationalism, globalization, liminality, the architectural sublime and the production of space have all been hallmarks in recent artistic practice and theoretical discussion. But space feels, somehow, like a fixed, closed category. You are either here or there, maybe moving between these two points. “The video starts. A grey mass materialises before my eyes. I can’t really recognise the shapes. I squint my eyes and long for a sound to guide me, to give me a clue. Maybe if I could hear seagulls, I would imagine myself standing on a cliff, watching the rough sea getting closer and closer, almost feeling the waves calling me, inviting me to jump, like mean sirens. But there is no sound. My mind wanders. The stream of images is quite hypnotising Maybe this is a macro shot of an insect, those images where you realize how hairy flies’ legs are. Spiky hairs like rose thorns. Under a microscope all the bugs become the perfect David Cronenberg creature. This untitled video arrives to my life through an email one early morning; the sender, the artist, an equally unknown entity as the piece itself. I am supposed to write about something and someone I don’t know at all. They found me, and it becomes an experience as intriguing as poetic, so I accept. A few weeks later, I have managed to meet the artist, at the private view of an installation set in the toilets of a pub in East London, of all places. She doesn’t want to give away any information, which I seek and push for cunningly. That first encounter doesn’t provide with much more, but a few days later I have discovered what the video shows. Now I know. The video is Julia’s mountain and it embodies the answer of a very important question for her and Carlos Pastor. “Now tell me Julia, which one is your mountain?”. We will hear this conversation, which was recorded in a car, in the exhibition at Oblong Gallery, as part of the installation “Horizontal Pleat”. The video will be another part of it. Julia’s mountain is not a physical, real mountain, but a composition of 4 different pictures recorded with a Super 8 camera. The pictures are inverted shots of a Tuareg’s turban, those folded tissues being the “horizontal pleats” of the exhibition’s title. A Tuareg is a nomadic man of the North African desert, and I wonder if this choice of Julia ­–another Spanish émigré like me– is entirely casual or, on the other hand, highly charged with meaning. But I am not supposed to ask. So it’s just the video, Julia’s mountain, the turban and me. All alone in a room. Knowing the original source of this images, oddly enough, doesn’t set my mind at ease, but triggers my thoughts to run even more wildly. 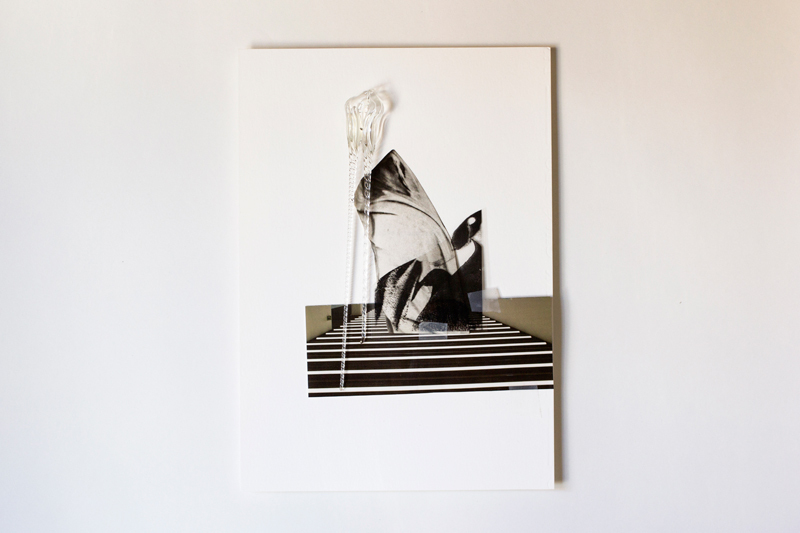 Julia’s work avidly encourages a sense of displacement, of dislocation, maybe even of deceit. She is playing a game of appearances and symbols with us, her public. Subjectivity is Mariscal’s main preoccupation when constructing and then showing a piece. She is not interested in imposing us a story, a narrative, a justification for her work. 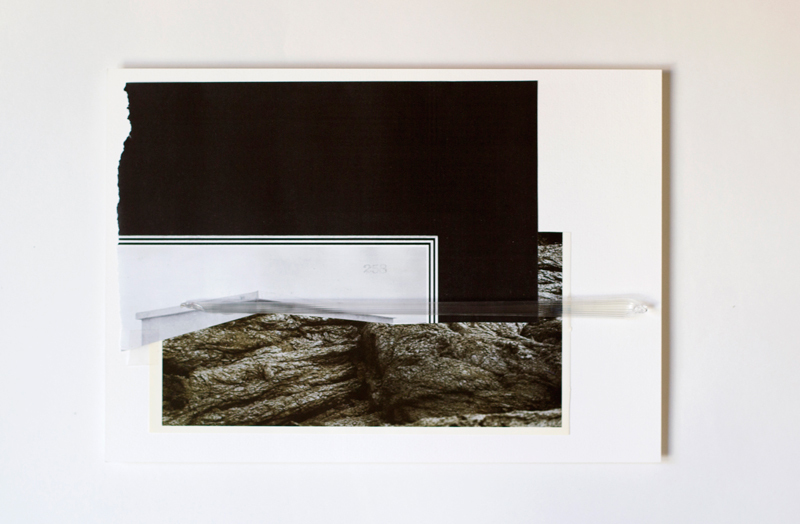 She offers a kind of raw material to the viewer to chew on, and she does that through processes of fragmentation and encoding of information. She folds and pleats, most accurately in this particular work. In his essay “The Fold. Leibniz and the Baroque”, Gilles Deleuze elaborates in the potentiality of the fold as a producer of subjectivity. Deleuze understands the world as a body of infinite folds and surfaces, which twist and weave through compressed time and space. In an interpretation of Leibniz’s philosophy that has become crucial for our understanding of the contemporary, the French thinker describe history and the event as multifaceted combinations of signs in motion, and the modern subject as nomadic, always in the process of becoming.